May 18-20, days 17-19 – Friday was a travel day. Driving from Capitol Reef to Bryce NP, we visited the Anasazi Indian Village State Park in Boulder, UT. The archeological site was occupied 1000 to 800 years ago. We drove on from Boulder with a heart pounding white knuckle drive on Utah Hwy 12 to Escalante. On the “Hogsback” where cliffs dropped 400 to 500 feet on both sides with no guardrails, we felt like we were flying more than driving! 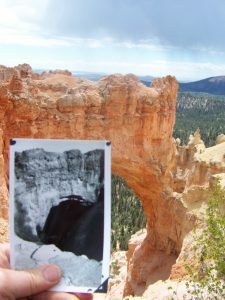 Seeing the red sandstone formations of Bryce Canyon again was like re-visiting an old friend. 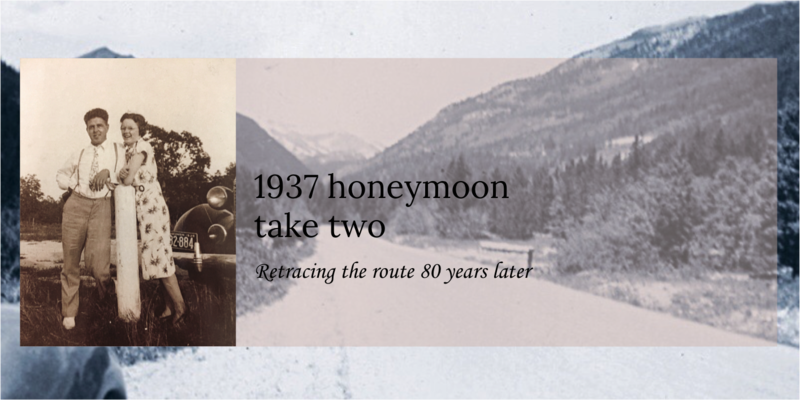 Matching the location of Earl and Ethel’s two pictures was exciting. The first photo was at Rainbow Point at the end of the 18-mile long scenic drive. Although the area is known for it dynamic change, it was thrilling to see how much the landscape still held the same forms! The second was at Natural Arch. 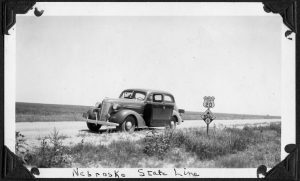 That too had changed little in 81 years. 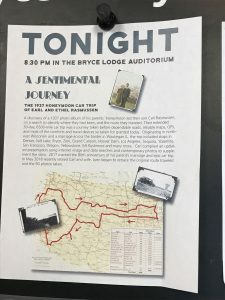 Our presentation of “A Sentimental Journey” was nicely attended and interest was high. 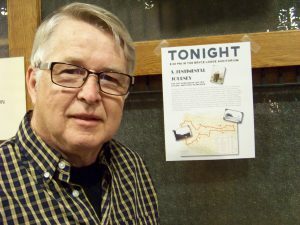 The talk was well promoted by Park Service staff and 25-30 fellow park visitors turned out. 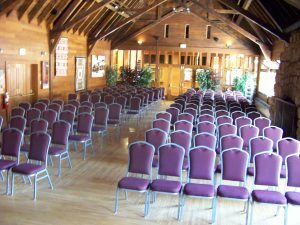 The very gorgeous Bryce Lodge auditorium was the location for Carl’s presentation. The entire Lodge was constructed by the Union Pacific Railroad in 1928 and is held to a very appropriate 1930’s decor theme! 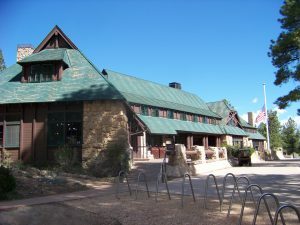 It’s not known if Earl and Ethel stayed at the lodge. Lynn thinks she saw them though sitting in the back of the audience enjoying it all! I like to think so too. I know I enjoyed sharing their story. 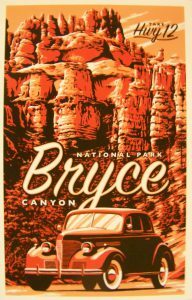 The Park Service concession has a classic car tour series of cards and posters for the national parks. Words hardly describe our thrill and excitement on discovering that for Bryce, a late 1930’s Chevy was selected! We think that’s Earl and Ethel in the front seat! What a glorious journey! Thanks for the roller coaster video of Highway 12. The real question is….did u see US in the back of Bryce auditorium??!! Harv says let us know when u need us to send u more money! Postcard arrived today. No sorry we missed you there. The money is holding up so far. Remember we panned for gold in Idaho Springs! What an adventure. It looks like it is all you hoped it to be. I appreciate “going along” with both. We look forward to seeing Bryce in August. Thanks again for the memories. We’ve been on Hwy 12 through Escalante several times. That area was some of the last in the US to be surveyed. 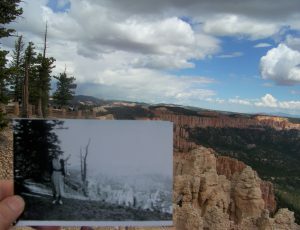 Also Bryce Canyon. I think we were there on a Sunday twice. Once I know was with Bethany, once with Sara. We took Grandma Rasmussen to Zion but didn’t do the Bryce Canyon side trip the first time through. You are getting to be a real pro at giving the presentation. What a perfect place to do it. And the postcards are a perfect touch- what are the odds they would pick that car?? 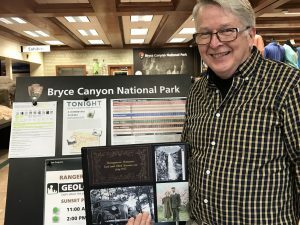 As Sue Buck said this is a great preview for our planned trip to Bryce and Zion in August – thank you. How neat to actually give your presentation there! What a wonderful experience for those attending, too!